These compact monitors from Swiss company PSI incorporate some very clever technology, including 'Class‑G' amplification, that helps put them in a class of their own! PSI Audio is almost certainly an unfamiliar name to most, yet I predict these intriguing Swiss monitor‑speaker manufacturers will quickly become as well known and highly thought-of as the many well‑established high‑end manufacturers, such is the quality of their products. PSI Audio started out as Relec SA in the late 1970s, the brainchild of Alain Roux, and have been producing a broad range of hi‑fi, PA and studio monitoring loudspeakers for over 30 years, both under their own name and as OEM manufacturers. However, the PSI Audio brand is now being marketed more actively worldwide, and the company's innovative products are being brought to the attention of a far wider audience. PSI Audio's production facilities are split across two sites. The speaker cabinets are made in St Croix, a small town in the Swiss Jura mountains with a strong history in the craft of making fine musical instruments and lavish music boxes, since the 19th century. Product development, electronics design, manufacture and assembly are performed at Yverdon alongside Lake Neuchâtel. This facility, built in 1989, accommodates a 150‑cubic‑metre anechoic chamber, seven metres high and incorporating four tons of isolation material, which is employed in the testing and development of PSI's loudspeaker designs. Like most manufacturers, PSI Audio claim to use several unique technologies in their speaker designs, each with a catchy name. In this case the relevant ones are AOI, CPR, PSC and Class G.
The first stands for Adaptive Output Impedance: the ability of the power amplifiers to adjust their output impedance to optimise the impulse behaviour and damping of the connected drive units. In essence, the circuitry determines the movement of the speaker diaphragm by analysing the current flow between amplifier and driver, and then adjusts the impedance as necessary to control that movement, maintaining as closely as possible a near‑ideal impulse response. So as the transducer travels to its intended position, the AOI circuitry maximises current flow to provide the best diaphragm acceleration to reproduce the transient impulse as accurately as possible. Once the transducer reaches the end of the impulse, the AOI circuitry then acts to provide an active brake, minimising diaphragm overshoot. PSI Audio claim that this technology makes their system "almost capable of reproducing a square wave”, and that the system is sensitive enough to detect parasitic driver resonance if other loudspeakers are being used in the room, and will damp it out automatically! The result is extremely low coloration and an impressively tight transient behaviour, even at low frequencies and despite using a ported‑cabinet design. CPR, or Compensated Phase Response, is a technology that corrects the additive phase shifts and group delays inherent in conventional crossover filters and mechanical transducers. It achieves this with carefully designed all‑pass filter stages, and the result is a remarkably precise stereo image and an accurate sense of space in the recording environment. PSC stands for Phantom Standby Control, and is a simple system to enable remote on/off switching. When a voltage of between 5 and 25 V is applied via 22kΩ resistors to both lines of the balanced audio input (relative to the cable screen), the speaker is forced into a standby state. In most cases, large‑value DC‑blocking capacitors will be required, to protect the output of the monitoring controller (or other audio source) from the DC control voltage. Presumably some users will find this a useful facility, but DC blocking capacitors are known to be a source of low‑level signal distortion, and the switch sensing — although the only practical arrangement given the use of a phantom system on the audio connection — seems inverted. Most remote switching systems use an external voltage to switch the speakers on, not off! Suffice to say I made no use of this option. Finally, Class G is an unusual amplifier topology that aims to achieve a power efficiency approaching that of Class‑D 'switching' amps, while maintaining the linearity of Class‑AB amplifiers. The 'Class‑G Amplification' box on the next page explains the concept in more detail. Both of the monitors under review feature the same rear‑panel controls, including knobs for input sensitivity and low‑frequency response. For this review I was supplied with two pairs of two‑way, active PSI Audio monitors: the diminutive A17M model, which employs an approximately six‑inch bass/mid‑range driver, and the larger A21M, with about an eight‑inch unit. Both models share the same one‑inch tweeter, the same basic cabinet construction, and the same amplifier chassis configuration. There is a smaller model in the range (the A14M), as well as a larger three‑way system (A25M), a centre‑channel model with a bass/mid driver on either side of the tweeter (A214M), a dedicated subwoofer (A225M), and a floor‑standing model (the A215M) in a similar configuration to the A214M. All models employ unusual but attractive burgundy paint‑finished MDF cabinets with a horizontal, slotted port vent across the bottom of the front baffle, below the bass/mid driver. A metallic‑black cabinet finish is available on special order, but at greater cost. The dimension and weight of the smaller A17M model are 320 x 200 x 230mm (HWD) and 8.4kg, while the larger A25M measures 400 x 250 x 300mm (HWD) and weighs 13.4kg. Specifications for the desktop‑sized A17M give a programme‑peak SPL of an impressive 115dB per pair at one metre. Frequency response is quoted as 44Hz to 23kHz at the ‑6dB points, a figure that narrows to 50Hz to 20kHz ±2.5dB. The crossover frequency is 3.6kHz, and the amplifiers supply 80W and 40W for the bass/mid driver and tweeter, respectively. The larger A25M is quoted as managing 119dB SPL for programme peaks (per pair again), and a response of 32Hz to 23kHz at the ‑6dB points or 38Hz to 20kHz ±1.5dB. 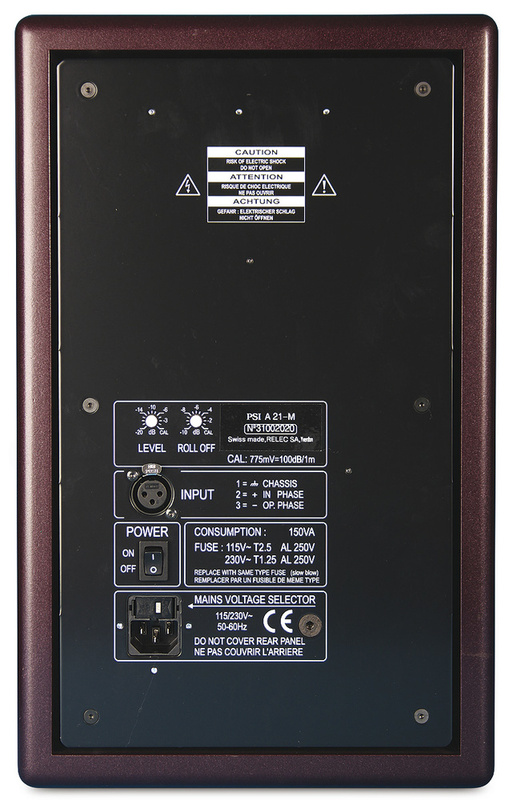 The crossover is also lower, at 2.4kHz, and the amplifiers are up‑rated to 120W and 50W. Both models feature an electronically balanced input with an impedance of 10kΩ, and a nominal sensitivity of 0dBu for 100dB SPL at one metre. The tweeter is set at the bottom of an unusually deep waveguide machined into the front baffle, and is consequently very well protected from accidental damage. This restricts the HF dispersion above about 4kHz to roughly 90 degrees in both the horizontal and vertical planes, which will help to minimise unwanted reflections from mixing consoles, computer workstations and side walls — no doubt contributing to the excellent stereo imaging. 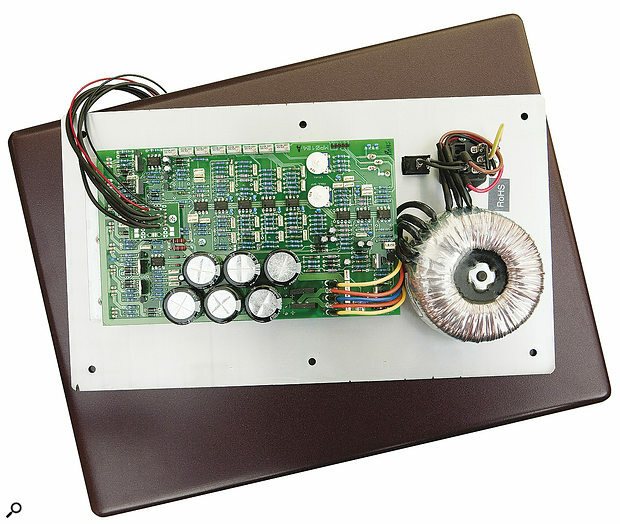 A front‑panel LED illuminates green when the speaker is powered, and red when in standby mode, or when the heat- or volume-protection circuitry is operating. The rear panel is metal and acts as a cooling heatsink for the amplifiers. It also carries just three controls: a mains on‑off rocker switch, and rotary controls for level and LF roll‑off. An IEC mains inlet incorporates a fuse and voltage selector, and both models employ a linear power supply with a substantial toroid mains transformer. The input level control spans a 20dB range, maximum sensitivity being 0dBu for 100dB SPL at one metre, while the bass attenuation control covers a 10dB range, starting from about 200Hz in the A21M and 250Hz in the A17M. This control is intended to correct for the boundary effect bass‑boost when the speaker is placed close to room walls or corners. My review was conducted with the speakers in a free‑field situation, with the bass control set to its 0dB calibrate position, but the handbook recommends settings of ‑4dB for a half‑space (near a back wall) situation and ‑7dB for a quarter space (corner) placement. These settings are less than the theoretical ‑6 and ‑12dB figures, and clearly there is room for experimentation and personal preferences in finalising the calibration. When the partnering A225M dual subwoofer is being used with either the A21M or A17M, the handbook recommends setting the bass roll-off to its maximum attenuation to optimise the integration and power handling. The amplifier PCB. On the right is the toroidal mains transformer, while to the left, you can see the diodes used to control the output stages' biasing and switching. I did much of my auditioning with the speakers mounted well away from side and rear walls, and driven from a Grace M902B monitor controller. From the outset it was clear that both the A17M and A21M were something special, and frequent direct comparison with my reference PMC three‑way IB1s quickly confirmed that fact! The level of performance was immediately and obviously far higher than that of the vast majority of similarly sized monitors. Moreover, the tonal matching between the two models was extremely close, which is always a sign of meticulous design and attention to detail. Both models exhibited a bass extension and power handling that belied their modest cabinet sizes, and both exhibited remarkable transient behaviour and control, with pin‑sharp stereo imaging. Tonally, these speakers are extremely neutral and accurate — voiced along the lines of classic British monitors from ATC, PMC and Harbeth — and completely free from the upper mid‑range presence hype that is so often used to convey a (false) impression of detail and resolution. Instead, these speakers provide real detail and superb resolution across the bandwidth, and do so without any sense of fatigue even after hours of critical listening. The top end is gloriously smooth and natural, yet wonderfully revealing and precise. The mid range enjoys negligible levels of the harmonic distortion that so often masks the mid‑range clarity in inferior designs. Indeed, the mids come across as totally uncoloured, and both monitors passed my very critical spoken‑voice tests with ease, delivering complete naturalness and accurate spectral balances without any hint of boominess, boxiness or sibilance. Moving down to the bottom end, the bass control — the ability to stop and start bass notes and separate bass guitars from kick drums — was remarkable, delivering a performance more associated with sealed‑cabinet designs rather than ported construction. Bass extension was also impressive, particularly for the very compact A17M. Simple crossed‑pair stereo recordings were portrayed with immensely precise stereo imaging that remained surprisingly stable across a wide listening area, and I was left in no doubt at all as to the absolute position when panning instruments across the soundstage. It sounds like a basic requirement — and it is — but it's surprising how many speakers present vague or blurred imaging. Room acoustics and reverberation filled the space between the speakers very linearly and naturally, and with a good sense of depth when auditioning appropriate material. Dynamics were reproduced naturally, with superb transient punch and clarity, and without any hint of monitor compression, even at silly listening levels. In fact, these speakers seem very comfortable working at levels that few similarly sized speakers would be able to cope with — and given the very low levels of coloration you will find yourself listening at much louder levels than you think you are if you're not careful! Working on a mix with these monitors was a joy, making compression and equalisation decisions very intuitive and natural, simply because you can hear what you're doing so easily. Flaws in recorded tracks are obvious; over‑compressed commercial music and low‑rate MP3s are exquisitely unpleasant to audition, just as they should be! Reviewing monitor loudspeakers is always a challenge. The technology involved in the vast majority of cases is very mature and with few significant variations. Consequently, the vast majority of monitors perform adequately and comparably to their peers at any given price level. Very few are unusably poor, but equally, very few stand out as exceptionally good. In fact, I can count those models I have reviewed that I would suggest fall into the 'outstanding' category on the fingers of one hand. My list would include PMC's AML1 (September 2001), Earthworks' Sigma 6.2 (April 2003), and K+H's O300 (October 2004), with honourable mentions going to Acoustic Energy's AE22 (May 2008) and, although I didn't review it, Event's Opal (August 2009). However, the time has now come to introduce my second hand to the count, because I have to add a new contender for the honour: PSI Audio's A21M monitor (and the A17M too). In short, these speakers are extraordinary and deliver a level of performance and accuracy that vanishingly few two‑way designs can match, and which would shame a great many three‑way offerings. There is no denying that they are expensive, but the cost is comparable to the few other monitors of similar performance and size. Auditioning is highly recommended for serious high‑end monitoring applications. 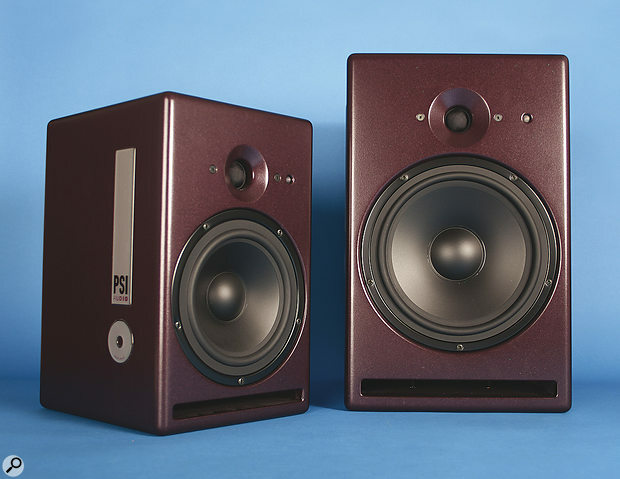 Compact two‑way active monitors capable of delivering a similar or better level of performance to these PSI Audio monitors are scarce, but potential short‑list alternatives should include the truly astonishing PMC AML2 (priced at $10,499 per pair), the superb ATC SCM20A SL Pro ($6700), and Geithain RL904 ($6200). At a slightly more affordable level, the PMC TB2SA MkII ($3699) and similarly sized but three‑way, sealed‑cabinet Neumann (formerly K+H) O300 monitors ($7016) should also be considered solid contenders. Most readers will be broadly familiar with the concept of amplifier classes such as Class A, B, AB and D. Put very simply, a Class‑A amplifier employs an output device (a valve or transistor) which conducts linearly on both the positive and negative halves of the audio signal. This approach has very low distortion, but is pretty inefficient and results in a lot of energy being wasted as heat. The Class‑B topology improves the efficiency significantly, by using separate output devices to handle the positive and negative halves of the audio signal, but with the drawback that the transition from one side to the other results in 'crossover distortion'. Class AB is a blend of these two ideas, biasing the output devices in such a way as to combine much of the Class‑B efficiency while retaining the Class‑A linearity, and this has been the dominant high‑quality amplifier topology for decades. In recent years, however, Class‑D amplifiers have become more popular, mainly because they offer very substantial efficiency gains compared to Class‑AB designs. Instead of employing output devices to vary the output current linearly, Class‑D amplifiers work by switching the output devices either fully on or off at an ultrasonic frequency, the on and off durations (or 'pulse width') being modulated by the audio signal. An output filter averages the resulting current pulses to reconstruct the audio signal and remove the ultrasonic switching artifacts. The idea is closely related to the sampling process in a digital converter, although there is no quantising stage involved, and it remains a completely analogue system. PSI's approach in its range of active monitor speakers uses a less familiar amplifier topology called Class G. This maintains the inherent linearity of the Class‑AB approach while improving significantly on its efficiency. At its heart, the design employs a low‑power Class‑AB amplifier, operating on relatively low power‑rail voltages, which does most of the work. However, the output‑stage circuitry is supplemented with additional output devices connected to much higher‑voltage power rails. Most of the time, only the low‑power amplifier operates, and the additional output devices are turned off — thus improving efficiency. But when the required output signal amplitude exceeds the voltage range of the low‑power stage, these additional high‑voltage output devices are switched on to facilitate the required higher‑voltage signal peaks. 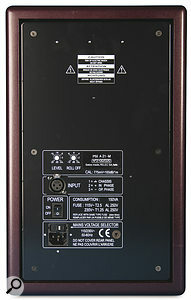 Controlling the switching of the high‑voltage output devices is critical to avoid another form of 'crossover distortion', but when optimised this approach works extremely well, running virtually as cool as a Class‑D design, but with the established audio quality and freedom from electromagnetic interference radiation artifacts of a traditional Class‑AB amp. The output‑stage biasing and switching is usually achieved with a number of diodes — far more than you would expect to find in a normal Class‑AB amplifier — and these can be seen in the output stages of the amplifier chassis in the PSI monitors (see photo overleaf). Pin‑sharp stereo imaging and a wide sweet spot. Remarkably tight low-frequency control and bass extension. Unusual but attractive red colour scheme. Closely matched tonality across different models. Small‑ and medium‑sized two‑way active monitors capable of delivering exceptional accuracy and neutrality, with remarkable LF control and extension, and precise stereo imaging. A17M £2598.85 (pair), A21M £4169.38 (pair). Prices include VAT. eMerging UK +44 (0)20 8941 6547. A17M $3490 (pair), A21M $5490 (pair). SimplifiAudio +1 858 414 3900.